Libraries Made Me | welcome to the janniverse. I was largely raised by libraries. Sure, there were some actual people who figured heavily in my life. But the first important piece of identification that I ever carried around with me on a regular basis was my Chicago Public Library card. When school was out for the summer, I borrowed so many books from my local CPL branch. So. Many. Every summer, they’d have their summer reading program, where they tracked how many books you read over the summer, and you’d get a certificate at the end to tell you how many books they were proud you had completed. My numbers were regularly in the triple digits. My favorite thing to do was sit around and read all day. As time went on, I played plenty of Nintendo at a friend’s house as well. But I always, always supplemented that with reading way too much. I read everything I could get my hands on. If it was laying around the house, I probably read it. This meant that I read a lot of Stephen King at a pretty early age. Mostly, though, I took books out of the CPL. Some of the most exciting times for me as a kid were when the Scholastic Book Fair was being held at our school. I was rarely ever able to buy anything more than a bookmark, but it was still fantastic. All those books, aimed at kids my age! Everything Ann M. Martin had written at the time, all lined up neatly in a row for me to ogle! THAT SMELL. The smell of new books was always overwhelming, probably because the book fair was usually held in this all-purpose hall where we held a lot of things, and the books brought their unique smell with them. I didn’t get to go to bookstores much, as a kid. I also didn’t often get to buy books of my own, except at the rummage sale. ($.25 original paperback copy of Agatha Christie’s 13 At Dinner was an AWESOME FIND and you will never convince me otherwise!) I knew that we were poor somewhere in my mind, but I only realized the extent of our poverty in retrospect, as an adult. Libraries are a big reason why. I could read anything I wanted as long as I respected the rules of the library. I always turned my books in on time. Due dates were sacrosanct, and missing one was absolutely unthinkable. I rarely even contemplated renewals, because I read so fast that I never really needed them. The library was my world, and I was happiest in it. Enter those awkward teenage years. I still read way too much. I did things like go overboard on paper writing for AP classes, handing in papers that I’d researched like crazy and were about three times as long as was required. Luckily, I had some pretty understanding teachers who encouraged me, even if it meant they had to spend a longer time grading my excessively long papers than they would have liked. I was a work/study kid, which meant I had to find gainful employment somewhere within the school to help offset the cost of my tuition. That was my first-ever library job. Mostly, I handled our small selection of periodicals. I swapped out old issues for new on our “Current” shelves. I also stamped incoming publications with our special library stamp, to make it obvious that these periodicals were our property. Current periodicals were meant for use within the library, although back issues that had been collected in volumes and bound could be checked out like regular books. Current issues were kept behind the circulation desk, but held in easy view of my fellow students. To prevent vandalism or theft, I was required to hold student IDs while any student perused current periodicals, along with a slip indicating which periodical was currently on loan to the student. I handled a little bit of most circulation duties while I was there. I checked books out and in — with only handy date-stamp pads and a pen, since our system wasn’t computerized. I shelved books (Dewey Decimal, thanks for asking). I tidied up the study tables after students left mountains of literature in their wake when departing for their next classes. At the time, I didn’t think much of it. I graduated high school and started college. After marveling that my new school’s library had an unparalleled graphic novel collection, I still supplemented my academic library excursions with the CPL — though not as much as I had when I was younger. Less time to read for fun and more time spent reading required materials for school, you see. Then I switched to a different university, and got a student job in — where else? — the library. Once there, I couldn’t get over our film collection. Every Criterion Collection entry you could ever possibly want was there — sometimes both on VHS and on LaserDisc. We had all sorts of documentaries, as well. We also had an amazing collection of sheet music — which made sense, given that our music school was quite impressive and well-regarded. Both these libraries used Dewey Decimal as well, so I felt right at home and could find anything I wanted very easily. As time went on, I got promoted within the library. I started working there full-time so that I could enjoy the tuition benefits that essentially made my college education free (well, except for books and lab fees). I still used the CPL, but only for anything I couldn’t get through our library’s own collection or Interlibrary Loan (which wasn’t much). This is also where I first learned the wonder and terror of SUDOC. Eventually, I moved on to another position in another academic library. This time, I made the switch away from the familiarity of Dewey to Library of Congress (LC) classification. (The horror!) While I did get used to it, it’s hard to undo a lifetime’s worth of Dewey. Funnily enough, it was around this time that I rediscovered my public library love — probably because it wasn’t as easy to ILL things at my new academic library as it had been at my previous one. Or maybe it was just because I was impatient. I still always had multiple stacks of items from both the library in which I worked and my local public. Unsurprisingly, it was around the time I got my second full-time library job that I began considering pursuing an ML(I)S. I was still an undergraduate, but it’s never too early to plan, right? This excessively long history indicates a few things. One, I’ve always been conditioned to want to have the ability to share in knowledge. I love it. I crave it. From my earliest years, one of the things that I have treasured most has been the experience of getting completely lost in a book, to the point where I’m convinced that I’m almost synaesthetically experiencing the whole thing (and I actually have to blink in surprise when I come to in the real world). Two, I’ve always been conditioned to want to share knowledge with other people. As I previously mentioned, I didn’t own that many books as a kid. Some, sure — mostly second-hand, or occasional treats from book fairs or the Scholastic book club flier. Most of my reading was done courtesy of libraries, though — so I never learned to be very picky about ownership of physical books. That’s probably also why, while I do own a lot more printed books (particularly cookbooks that offer some sort of cultural and historical insight into cuisines) than I did when I was younger, I do not and will not hate on e-books. Ever. It’s one thing to love and cherish the printed word, and the smell and feel of bound printed matter in your hands. I’m down with that. What I don’t appreciate is the inherent snobbery that sometimes (not all the time, but enough) stands behind arguments that paper books are somehow more “real” than their electronic counterparts. Used books can be inexpensive, but new books are pretty pricy. Not only that, but having a large printed book collection requires space — and the amount of space you have available to house a large printed book collection is usually directly proportional to how poor you are. It’s obvious from what I’ve said above that I love books. For the sake of argument, I’ll limit this example to only the books I’ve found so good that I’ve read them multiple times. If I had to store a bound, physical version of every single book that I’ve read multiple times, I wouldn’t have enough room in my house. I don’t know many people who would. That’s one reason I’m really glad that e-books exist. E-comics, as well. I’ve been a comics fan since I was a kid. My interests wax and wane, but those long, white cardboard boxes take up space. There’s a certain tactile joy in bagging and boarding each new issue, but that joy is quickly erased when you realize you have to go to the store for yet another cardboard box, and then have to figure out where you’re going to put that cardboard box. While I do have an attic, storing comics up there is just asking for trouble. I think that both printed books and e-books can peacefully co-exist as long as people aren’t closed-minded about them. (Mind you, that’s true of most things, but still.) There will always be issues of copyright, ownership, DRM, and appropriate compensation for writers (and everyone in the publishing process) to discuss. That’s fine, and as it should be. While the publishing world has been in the midst of serious change for several years, I don’t believe printed matter will disappear overnight — or ever. Not completely. As a lifelong music enthusiast, I’m happy to note that people are still pressing vinyl — new vinyl, not just stuff you can find in used record and thrift stores. Printed books are a million times more portable and usable in transit, so if records can survive via a worldwide enthusiast’s market, I’m quite sure books can do the same — and probably even better. Libraries have made me a reasonably well-rounded person. I use them at least once a week for work-related stuff, even though most of my writing currently appears online. Why? Because I like to use reliable information. I want to do the best research possible whenever I write, no matter what it is that I’m writing. I frequently write about the intersection of iconic cars and movies. My subject matter may seem trivial, but that doesn’t mean that I don’t want to find every bit of reliable documentation that I can, so I get the story right. I honestly couldn’t do that without libraries. To address concerns that libraries rob creators of money: while I can’t speak for anyone but myself, I can offer my own process for analysis. I don’t have a lot of money. I’ve never had a lot of money. So what I do have, and what little I have available to spend on fun stuff like books, I like to spend carefully. 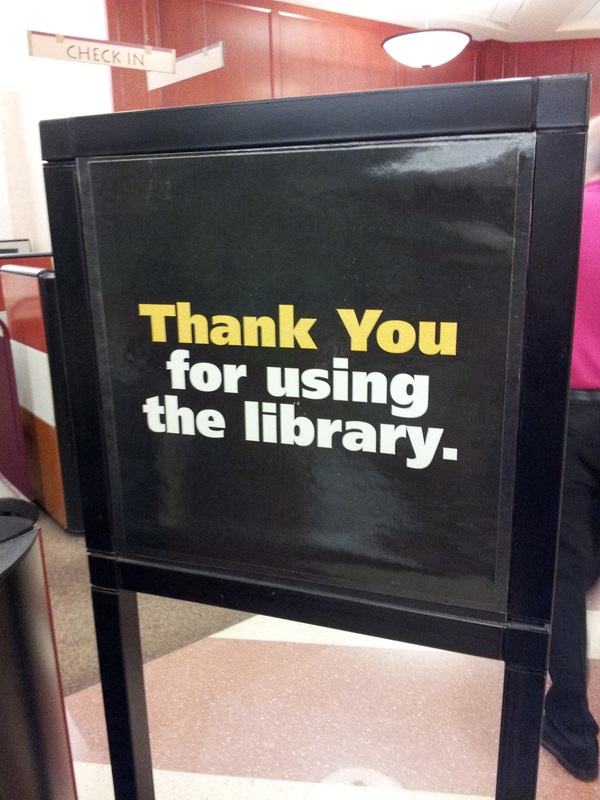 Libraries help me do that. I can check something out (no pun…OK, partial pun intended), see if I really love it and will read it more than once, and then return it. If it’s something that I’ll read or reference often, I’ll go buy myself a copy. These days, that’s more likely to happen in digital form than in print, because it’s much nicer to carry my personal library in a 7” tablet than it is to strap all my bookcases to my back. My local public has access to a shared database full of e-books, as well — and the best part of taking those out is, I don’t have to go anywhere. I can check books out at 3am if I want. Also, no overdue fees! When an e-book on loan from the library expires, it simply disappears from my device. Libraries are really great for being able to try different authors, genres, subjects — you name it. You can find out more about who you are by finding different books that speak to you, instead of simply sticking with what you know. A good library is an inexhaustible source of information on almost anything you’d want to know. This holds true for both public and academic libraries. As well, each library has its own character, its own specialties…and it’s fun to find out what those are as you go along. I am a product of a lifelong flirtation with this wonderful fountain of knowledge and possibility. Libraries are an invaluable resource to those who use them. If you’re not using yours, you’re missing out. I don’t care what your book budget is; unless you actually are a library, chances are excellent that a good library near you has a better collection than you do, and something you can learn from it. To quote one of my favorite book series, “all knowledge is worth having.” Libraries put an unbelievable source of knowledge within reach of anyone who holds a library card. If you don’t have a library card, public libraries will still let you browse and read materials within the library; you just can’t take them off the premises. As a kid who was raised by libraries, news of libraries being closed and/or severely underfunded breaks my heart every time. I can’t help but think about what my life would have been like without libraries. Every time, I come to the same conclusion: I have absolutely no idea who I’d be without libraries, but I’m quite sure that I wouldn’t be who I am today. Libraries served as a stabilizing force in times of chaos. They provided a refuge within their comforting walls, a place where I could forget any of the daily stresses or cruelties of life, and just dive headfirst into a good book. Doing research had much the same effect, except it gave me more focus — and still does. While reading a good book often gets me lost in that book’s world, doing research forces me to focus on any questions I want to answer, and finding those answers. These are joys that I truly feel everyone should have.